Grapeseed Extract, alcohol-free red wine & apples all have a powerful natural aromatase inhibitor in them called Procyanidin. This study shows how grape seed extract can inhibit aromatase by at least 80%. Green Tea also contains procyanidin but green tea also helps you lose fat where most of the aromatase enzyme is made. Dark chocolate, peaches, black beans, blackberries, nectarines, kiwi, mango, bananas, black eye peas, walnuts & cashews also contain procyanidin. Parsley & Celery are high in 2 natural aromatase inhibitors called Apigenin & Luteolin. Apigenin may also stimulate your body to produce more testosterone. Red wine, rosemary, oregano, artichoke, peppermint, thyme, spinach, basil & chamomile also contain Apigenin & Luteolin. Improve your Gut Health & Liver function mainly by eating healthier organic foods, drinking mostly water and getting at least 25 grams of fiber daily so it'll be easier for your body to flush out excess estrogen. Eat more RAW cruciferous vegetables like broccoli, cabbage, and kale because they contain Indole-3-Carbinol (or I3C) that gets rid of excess estrogen. You can Supplement with I3C or eat from this list of cruciferous vegetables. Bonus: I3C is also an aromatase inhibitor. Use glass, stainless steel, ceramics or 'BPA Free' products to store food & water instead of plastic & Styrofoam products with the highest amounts of xenoestrogens. If you must use anything plastic then do not heat it in anyway because this makes the xenoestrogen more powerful. Use natural personal care products and don't use any soaps, toothpaste, lotions, detergents, shampoos, body washes or shaving products, colognes, or air fresheners with parabens (methylparaben, ethylparaben, propylparaben and butylparaben) as an ingredients. Use natural plant-based cleaning products. 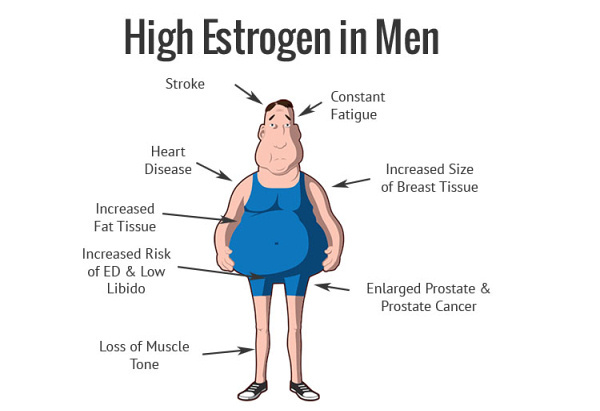 It's impossible to completely avoid all xenoestrogens because as you can see from this list they're everywhere but since most xenoestrogens accumulate in your body fat you can simply lose fat while taking these steps to get rid of excess estrogen to naturally increase your testosterone without worrying so much about trying to avoid xenoestrogens.